Crawl space insulation is a helpful way to protect the inside of your home from outside air and keep it warmer in cold winter months. Insulating your crawl space can be difficult, but with the right products and the right help the job can be completed quickly and correctly. 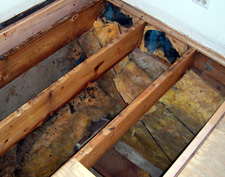 But before you jump right in and start installing fiberglass insulation in the crawlspace, doing some research on insulation materials may help you make the best decisions for your crawl space insulation. BlueMaxx Basement Systems would like to invite you to meet with one of our crawl space specialists for a Free Estimate on making your crawl space more energy efficient- call or contact us online today to get started! 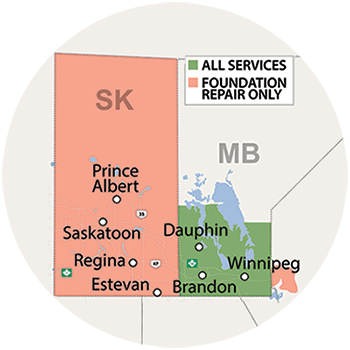 We serve Winnipeg, Arnot, Brandon, Brochet, Dauphin, Island Lake, Little Grand Rapids, Lynn Lake, Melita, Nunalla, Port Nelson, Russell, & Swan River, working in all areas of Manitoba. 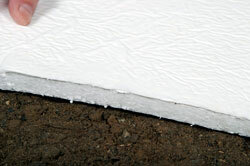 CleanSpace® HeatBlock is a 10 mil cord-reinforced crawl space liner with UltraFresh antimicrobial protection. It works as another line of defense between your crawl space and the outside air. 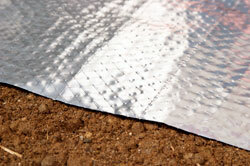 The shiny, reflective surface stops heat transfer and reflects heat from your home into your crawl space keeping it warmer than the outside air. This crawl space liner is perfect for crawl spaces with openings such as air ducts and furnaces. HeatBlock will recoup the energy loss through open ductwork and radiate it back into the room. All of these crawl space insulation products can be used together in different combination in your crawl space as well to give you all the benefits of a complete system. Call us or contact us online today for your free crawl space inspection and quote! BlueMaxx Basement Systems proudly serves the cities of Winnipeg, Arnot, Brandon, Brochet, Dauphin, Island Lake, Little Grand Rapids, Lynn Lake, Melita, Nunalla, Port Nelson, Russell, Swan River and the surrounding areas of Manitoba.